Your visit to Keillor House will be greatly enhanced by learning in advance something of the history of the house and the family that built and lived in it for two generations. This is their story in brief compass, intended to prepare you for the tour. When Yorkshire immigrant John Keillor (1761-1839) completed his new stone house in 1815, he was in his fifty-fourth year. His wife, Elizabeth Weldon Keillor (1766-1851), also from Yorkshire, was forty-nine. Their eight children were grown and all but the two boys would soon be married and in homes of their own. Keillor House was not built to accommodate a growing brood but to announce that the couple had come up in the world, and to serve as a suitable setting for their golden years as one of Dorchester’s leading families. For many years, the Keillors had been ordinary hard-working farmers like most of their neighbours. Their first home was a log cabin later sided with clapboards to make it look a little more upscale. Then, through family connections and exemplary service in various local offices, John rose in public esteem and was duly rewarded with an appointment as a Justice of the Peace in 1805. The office brought a great deal of prestige, but it didn’t pay very much—men sought it more for the honour than the money. Although prosperous enough as farmers went, the new stone house was a little more than his purse could comfortably bear. Compromises had to be made, plans scaled back. The building of Keillor House is thus a story of ambition and accomplishment, but also of stretching and straining—and it’s written in stone. Built in the Georgian style, it follows the rules of symmetry, balance and harmonious proportions favoured by the elite of 18th century Britain and America. (The hip roof and raised wall on the east annex or ‘Dairy Room’ is a later modification; originally, the two annexes were symmetrical.) But it’s very plain Georgian. Instead of a colonnaded portico, only a relatively modest stone moulding frames the front door. The entrance hall, flanked by the double parlour and dining room, and the matching arrangement on the second floor follow the usual Georgian pattern. But the house is actually rather small in comparison to ‘Rocklyn’, Dorchester’s other stone mansion built some twenty years later by one of Canada’s Fathers of Confederation, Edward Barron Chandler. The front wall is of finely finished cut stone (ashlar) but the rest of the building is of rough-hewn quarry stone put together in the manner of an ordinary Yorkshire farmhouse. But this is all part of the charm. Keillor House is both elegant and homey. Guests would have been impressed but not intimidated, just as befitted the modest pretensions of a good stolid Yorkshireman. Until the end of the 19th century it served as a farmhouse, as traces of the barns and outbuildings still bore witness until fairly recently. The west annex, now called ‘Grandma’s Room’, was used as a post office from 1825 to 1838, for John Keillor was also Dorchester’s first postmaster, while his younger son, Thomas, was the second one. The east annex, later converted into his office by High Sheriff Joseph McQueen, may have once been a ‘dairy room’ where milk, cream and butter were kept before going to market. (This is not certain.) John Keillor owned one of the larger dairy herds in Dorchester (possibly about twenty-five head, very small by today’s standards) and regularly shipped butter and other farm produce to Saint John and Halifax. What you see today is not all the work of John and Elizabeth. On John’s death in 1839 the house and much of the farm went to his unmarried son, Thomas, who promised to keep his mother in circumstances as comfortable as his means would allow. He became a merchant and real estate dealer as well as a successful farmer and was considerably wealthier than his father. Shortly before Elizabeth’s death in 1851, when he was himself fifty-three, he married Mary Jane Moore, a cultured and intelligent lady twenty years his junior. A few years later, following the death of their parents, she brought her artistic unmarried sister, Catherine, into the house. Probably under the two sisters’ influence, considerable alterations were made, including the archway dividing the parlour into two distinct spaces and most of the mantle pieces. The kitchen was enlarged and the large open fireplace was enclosed and replaced by cast iron stoves, likely made in Sackville, but possibly in Dorchester where there was also once a foundry. The modification of the ‘Dairy Room’ was probably also the work of Thomas and Mary Jane. Paintings and other works of art, many of them gathered by the Moore sisters’ world-travelling brother, William, adorned the walls and knickknack shelves, while leather-bound classics displayed in glassed-in bookcases in the upstairs hallway impressed the guests. Piano and poetry recitals enhanced the atmosphere of gentility, and even the maids got into the act. Mary MacDougal is said to have memorized poetry while ironing. Thomas died in 1887 (at age eighty-nine) and two years later Catherine married a Methodist minister, leaving Mary Jane to a decade of lonely widowhood, comforted, however, by the companionship of her two maids, Mary MacDougal and Matilda Saulnier. The girls were more like daughters to her than servants, for she and Thomas had had no children of their own. No doubt George Card, Thomas’ manservant and coachman, was also treated as part of the family. After Mary Jane died on Christmas Eve 1899, most of the farm was auctioned off and the proceeds divided between Thomas’ nieces and nephews. High Sheriff Joseph McQueen, or more accurately his wife, Edessa Chapman McQueen, a great granddaughter of John and Elizabeth Keillor on both sides of her family, bought the house and twelve acres around it. 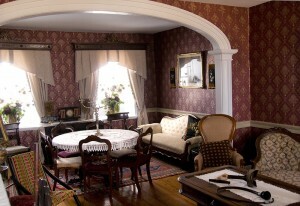 Parts of it were again remodeled to serve as the Sheriff’s office and possibly a library (‘Grandma’s Room’). When the Westmorland Historical Society acquired it in 1965 it was in a rather dilapidated condition. 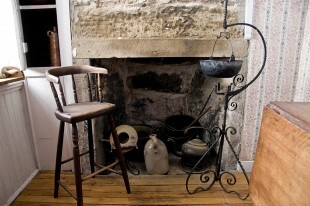 Following the advice of Peter John Stokes, the noted historical architect who guided the reconstruction of Upper Canada Village, it was restored to preserve as many of the original features as practicable—the large open-hearth fireplace is the most striking example—while emphasizing those of its peak elegance during the reign of Mary Jane and Catherine. Only a few items belonging to the Keillor family—all of them Thomas’ and Mary Jane’s—were recovered for the museum. They include pieces of a handsome black and silver dinner service, some silver-plated napkin rings and a few silver teaspoons engraved with Mary Jane’s initials that were given as a wedding present, as was the charming German-made music box displayed in the parlour. It could very well have been the gift of the E. B. Chandlers, as the two families were on very close terms. Both were pillars of Trinity Anglican Church, and Thomas was a pallbearer at E. B.’s funeral. 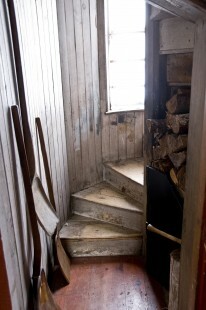 The finely crafted wardrobe in the master bedroom, made in New Brunswick, also belonged to the second generation of Keillors to live in the house. 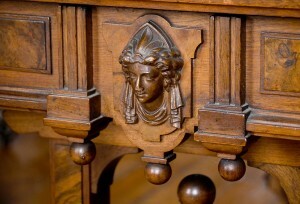 Although limited in the number of actual Keillor artifacts, the museum’s collection contains a great many interesting articles that offer a vivid impression of domestic life among Dorchester’s elite during the Victorian Era, and in some cases much earlier. 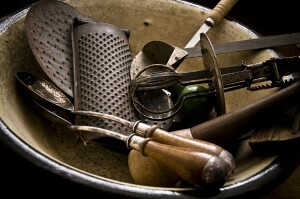 The bake oven, open-hearth fireplace and assortment of kettles, pots, pans and fireplace tools bear witness to the centuries-old methods of cooking—in all its drudgery—that produced the meals during the first forty years or so of the house’s history. The period sofas, fancy fire screens, ivory fans and footstools cushioned in petit point evoke the comfortable, if crowded, elegance of a Victorian parlour. The fine mahogany table and chairs that once belonged to a son of E. B. Chandler, the hand-painted wallpaper, the silver candelabra and the mahogany-veneered buffet butler’s table conjure up candlelight dinner parties and polite conversations about politics, fashion and the latest vessel to be launched from the Dorchester shipyards. The mahogany sleigh bed, the mahogany wardrobe, Franklin-style heater, and porcelain chamber pots in the master bedroom speak eloquently of both the comforts and discomforts of the age. The manservant George Card’s small, unheated room up the spiral staircase, with its straw mattress and Spartan furnishings, exposes the social gap between masters and servants, even those considered part of the family. Other items belong in the category of ‘the curious and the quaint’. They include a high chair that converts into a stroller and the miraculous ‘Vedee Vibratory Massager’ that cures among other things: rheumatism, gout, asthma, thyroid and lung troubles, swollen glands, insomnia, kidney and liver disease, influenza, head colds, dyspepsia, deafness, hemorrhoids and maybe even the heartbreak of psoriasis. If you are suffering from one of these conditions—or anything else besides—ask your guide for a free demonstration. 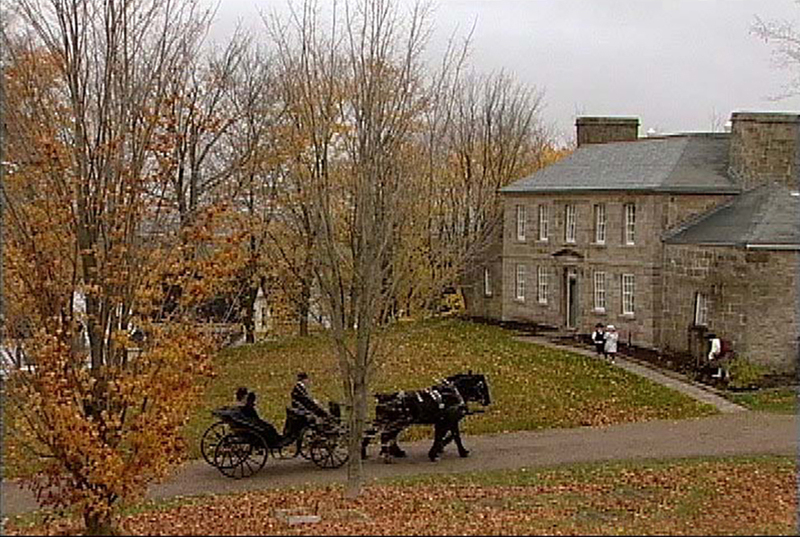 The tour also includes a visit to the Dorchester Penitentiary Collection and the St. James Textile Museum.